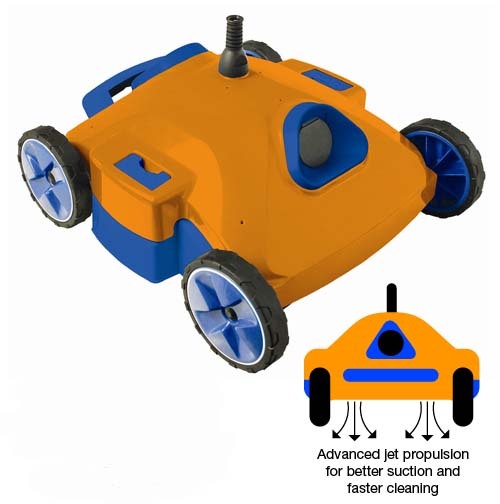 ECONOMICAL NEW ROBOTIC CLEANER FOR IN-GROUND AND ABOVE-GROUND POOLS! This advanced new "Super Rover" is the finest economical robotic cleaner for in-ground and above-ground pools. Our fully automatic dynamo features an advanced "Linear Jet" motor that delivers superior suction and faster cleaning times. 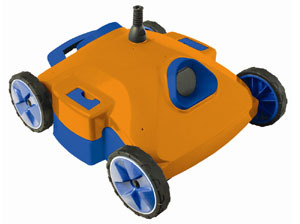 Super Rover is programmed to make your pool spotless in one to two hours. Super Rover has its own filtration system and will remove dirt, algae, bacteria, debris and sand from your pool floor with ease. A completely safe 48 volt DC motor is powerful but costs pennies a day to operate. Super Rover cleans vinyl, gunite and fiberglass pools as well as in-ground and above-ground shapes. Wide improved tread wheels will not slip or slide on vinyl surfaces and easily clean every inch of your pool floor. Super Rover's more powerful motor picks up large debris that others would leave behind. The unit's enclosed filtration system disperses heat & chemicals throughout your pool and also reduces the amount of time your existing filter has to run. Super Rover is easy to use and comes complete with an updated power supply, dual easy cleaning filter bags, 40' of floating, kink free cord with EZ swivel. Invest in the finest, most economical robotic cleaner for above-ground and in-ground pools!